By May of 1945, most of Europe was in shambles, utterly destroyed by nearly 6 years of war waged in countries such as Czechoslovakia, France, England, Italy, The Soviet Union, Spain, The Netherlands, Belgium, Austria, Poland and Germany. Considering the unyielding daylight bombing by Allied aircraft over German targets and the “Nerobefehl” or Nero Decree (scorched earth) policies of the retreating Wehrmacht, it is amazing that the survivors even had homes to return to after the cessation of hostilities. General Alfred Jodl signs the instrument of surrender. When the weapons and machines of the war fell silent, some 40-million* non-combatant people (civilians) had been obliterated – wiped from existence. In the Allied European nations, estimates of the civilian dead are upwards of 25 million. For the European Axis nations, nearly 8,000,000 civilians were gone. Utter devastation was present seemingly in every location. Those who survived the conflict were left facing uncertainty and immense challenges to reconstruct and rebuild their cities and towns from the mountains of rubble and bomb-craters. The effort would require a coalition of nations to coordinate the monumental effort while overseeing the dismantling of the German war machine. This map shows the post-war occupation zones agreed upon during the Potsdam Conference. Each Allied nation would be responsible for the management of their zone in order to restore peace and facilitate the destruction of the Nazi war machine. In the waning weeks of conflict in Europe, the Allied nations had established and agreed upon boundaries that would limit the extent each nation’s push as German resistance ebbed. By the first week of May, 1945, it was all over. Hitler, fully aware of the fate that awaited him should he be captured by Soviets who were closing in on his bunker, chose to take his own life on April 30. Grand Admiral Karl Dönitz now in charge (Reichsmarschall Hermann Göring was removed from this position due to his attempt to take power prior to Hitler’s death), agreed to surrender unconditionally to the Allies. The instrument of surrender was signed on May 7, to take effect the next day, by Germany’s representative, General Alfred Jodl, who would be hanged in 1946 having been found guilty of war crimes. During the first half of the twentieth century, Germany had initiated two world wars, and initiating and inflicting considerable devastation upon other nations. Rather than leave this repeat aggressor to its own devices and risk a third global war, the Allies decided to be proactive in overseeing not only the German reconstruction effort but to instill a system (under the Potsdam Agreement) of governance for control and management. Not only did the Allies agree to create zones of occupation but they had to work to establish and define national borders due to Germany’s continuous disputes and territorial claims spanning the previous decades resulting in the redrawing of much of the Western European map. This map shows the boundaries of the four zones of Berlin – what later became the two cities of West and East Berlin. With increased tensions between the former allies over which nation would be the sole supplier of West Berlin (the USSR sought control of West Berlin by making the city solely dependent upon Russian provisions) , the Soviets began an 11-month long blockade (June 1948 – May 1949) in an effort to choke off the supply routes (roads, rails and waterways) between West Germany and West Berlin prompting the United States and Britain to commence a massive-scale relief effort, flying all supplies into the isolated city. Medal for Humane Action – Berlin Airlift. This medal was awarded to U.S. service personnel for 120 days of participation within the boundaries of the Berlin airlift operations between 26 June 1948 and 30 September 1949. The original intent of the allied agreements was to eventually merge the zones back into a single German nation. Between 1947 and 1949, the three western zones (American, British and French) merged to form the West German Federal Republic of Germany (FRG). Due to continued breakdowns in negotiations with the Soviets, the Eastern zones would remain in Soviet control and a subsequent establishment of communist East Germany – also known as the German Democratic Republic (GDR). Within two years of the creation of the German Soviet-state (the GDR), fear began to run rampant among the East German citizens who were witnessing the increased control being foisted upon them by the Stalin regime. In West Germany, reconstruction was in full swing and her citizens were beginning to taste the freedom and prosperity of a democratic society. Seeking to escape the death-grip of communism, East Germans began to flee the GDR for the FRG (West Berlin, specifically) beginning in 1950. By 1953, upwards of 1 million East Germans had escaped in nearly four years’ time – over a quarter million in the first few months of ‘53 alone. East German troops stand guard at the Brandenburg Gate, 1961 prior to the construction of the Berlin Wall. Seeking to stem the outflow of their citizens, East German officials began restricting travel to western areas, following the direction of other Eastern Bloc nations. This control would be tightened over the next several years. Losing more than 3.5 million to successful escapes to the West, the first elements of the infamous wall would begin to be set in place in August of 1961 by order of GDR government officials. It is unknown, however if the decision was directed by Soviet Premier Nikita Khrushchev. The Iron curtain was solidifying, being set in concrete. This image shows the hasty construction of the Berlin Wall that was well underway in November of 1961. For decades, the wall would be in place, surrounding the city. Unlike the ancient times when cities were walled to protect those within from invaders, this wall was constructed to keep its citizens from escaping to freedom. The Wall stood as both a symbolic and literal representation of communism. For those behind it, getting beyond the Wall meant having a chance at a better life and that getting there alive would be a monumental challenge. Countless few did make it across while Some 136 people would die in direct connection to the Berlin Wall. 98% of those deaths were the result of attempted escapes – 97 of them were shot dead by GDR border guards. Note the large space, known as the “Death Strip” between the two walls. Certain death awaited those who attempted escape. This photo was taken at the wall along the Luisenstadt Canal (it had been filled-in during the 1930s). By the mid-1980s and the height of President Ronald Reagan’s time in office, Soviet control over Europe was beginning to wane. Fed up with the boot of communism, the citizens of the Eastern Bloc nations began to revolt as they pursued democratic freedom. Seizing upon the momentum of the spreading freedom and liberty, President Reagan visited the Wall and gave the famous speech at the Brandenburg Gate, calling for the removal of the wall. The Wall had effectively closed off the historic Brandenburg Gate. The sign in the foreground provided its readers with a stern warning that they were now leaving West Berlin. The grip of communist control continued to disintegrate. In 1989, beginning with Poland, the revolution was in full swing as one by one, Eastern-bloc nations emerged from behind the Iron Curtain. On November 4th, more than 500,000 East Germans gathered at the Alexanderplatz in protest, the culmination of the Peaceful Revolution that had started previously in September. By the 9th of November, the Wall began to fall – the actual demolition taking the better part of the following year. German reunification was now free to commence. Since WWII, the U.S. military has maintained presence in Germany in an evolving capacity beginning with dismantling of the Nazi war machine to providing security and stability in holding the spread of Soviet communism in check. Today, U.S. Army and Air Force bases are maintained in Germany, strategically located, providing vital services and resources for forward deployed forces. Collecting items directly related or connected to the allied occupation and the Berlin Wall, to me is an interesting proposition. For militaria collectors, locating a grouping from veteran who served in the Berlin Airlift (something of a rarity) or of guard at Checkpoint Charlie would make for a uniquely historic display. Along with the occupation medal that was awarded to my uncle for his post-VE Day service in Germany, I have some signage with stern messaging in both German and English. For $30, you could acquire a piece of the Berlin Wall like this one (source: eBay image). If collectors simply wanted a piece of the Berlin Wall, there are plenty of online sources selling pieces of varying sizes, though it would be a dubious pursuit as an investment as there were nearly 70 miles of the double-wall. *This number includes the victims of the Holocaust. I started this blog as a continuation of a similar effort that I undertook (as a paid gig) for a large cable television network. I spent some time contemplating a suitable name for this undertaking, settling on The Veteran’s Collection for a number or reasons. The simplest of those reasons was to express my interest in militaria and how my status as a veteran guide both my interests and desire to preserve history. Though my wife might argue, my collection of patches is rather small as compared to those of true military patch collectors. I tend to be more specific about the patches I seek (such as this USS Tacoma crest edition). Often, I equate my collecting of military items in the vein of being a curator of military history and the role that the military has played in the securing and preserving of basic freedom for our nation (and for the people of other nations who have been trying to survive under repressive regimes). In gathering and collecting these items, it may appear to some that I am glorifying war. Having in my possession weapons (firearms, edged weapons, munitions, etc.) might signify glorification to the untrained eye however these items are part of the overall story being conveyed by collection. As I scour my collection, I begin to realize that the overwhelming majority of items are Navy-centric. This 1950s U.S, Army cap is part of the display that I am assembling of my paternal grandfather’s older brother’s service. I am a fairly soft-spoken person when I am out in public (though people who truly know me would have a difficult time believing this). When political conversations emerge near me (when waiting in line or casually walking past strangers in public settings) I have heard, on many occasions, discussions focus on perceptions of men and women who serve ( low-key or have served) in the armed forces. Often times, gross mis-characterizations regarding people in uniform begin to emerge as the dialog devolves into denigration of active duty and veterans as being war-hungry criminals, bent on killing innocents (women and children). I can’t count how many times I have stood in line, listening to people in front of me expressing how frustrated they are when they see a soldier in uniform ahead of them receiving a discount for a food item or service equating their time in service as legalized murder. I served ten years on active duty and had two deployments into a combat theater, one of which I and my comrades were engaged by the enemy. In all of those ten years, I cannot recall a single person whom I served with who desired or wished to see combat. We prepared and trained for it hoping to never see it. I don’t think that I have ever met a combat veteran who wanted to talk openly about their time under fire. To have the uneducated civilian boil down our willingness to don the uniform, train for years while understanding fully that at some point during our service, we could see the horrors of combat as being blood-thirsty war-mongers only serves to show the extent of their ignorance. I recently read two articles today concerning veterans of World War II who have (or had) committed their remaining years educating people about the horrors of war that each of them faced. The first article was about one man, an IJN fighter ace Kaname Harada, who took every moment that he had left in order to do what the Japanese government is failing to do; educating younger generations to warn them about being drawn into future wars. “Nothing is as terrifying as war,” he would state to an audience as he spoke about his air battles from Pearl Harbor to Midway and Guadalcanal. As I read the article, I zeroed in on a chilling quote by one of Harada’s pupils, Takashi Katsuyama, “I am 54, and I have never heard what happened in the war.” He cited not being taught about WWII in school, continuing, “Japan needs to hear these real-life experiences now more than ever.” I am baffled that a man who is a few years older than me was not taught about The War in school. This WWII Army garrison cap features the orange-and-ultramarine colors of the Air Corps. Both of these men clearly understand the cost of war and the hell that they faced when they took up arms and yet neither of them could be characterized with the ridiculous “war mongers” moniker often applied to warriors. The reasons that people collect militaria are as diverse as each of the hobbyists’ backgrounds. The community of collectors can be completely aligned and in lock-step with each other on some militaria discussion topics and in near animus opposition on others. I tend to stay away from collecting medals and decorations; specifically, anything awarded to a veteran (or, posthumously to his family) due to how a great number of collectors commoditize certain medals (Purple Heart Medals, specifically). I withhold judgment as I abstain from even discussing the medals in question. For the laymen, a Purple Heart is awarded to service members wounded or killed in action. Collectors attach increased value for medals awarded (engraved with the recipient’s name) for posthumous medals; if the person is notable or was killed in a famous or infamous engagement, the value compounds (there are several other contributing factors that influence perceived monetary value). Purple Heart Medals are a very sensitive area of military collecting and nearly every medal was awarded to combat veterans – soldiers, marines, sailors and airmen who were serving in a war or wartime capacity. There are several collectors who use their Purple Heart collections to demonstrate the realities of the personal cost of war. These caretakers of individual history, such as this collector, painstakingly preserve as much of the information surrounding the WIA and KIA veterans, often maintaining award certificates and even the Western Union telegrams that were presented to the recipients’ parents or widows. Seeing a group with the documentation together is heart-wrenching. A few of the selected items that my uncle brought back at the end of the war in Europe. Militaria collecting can be very personal as many of the items, like medals (such as the Purple Heart) actually belonged to a person who served. In my collection, I have uniforms from men who served from as far back as the early 1900s up to and including the Vietnam War (not including my own as seen in this previous post) with the majority centered on World War II. Nothing could be more personal than the uniform worn by the veteran. Having personal items, in my opinion, enhances the collecting experience because of the desire to research what that service member did when they served. Uncovering a person’s story is to understand the sacrifice and cost of leaving family behind to serve rather than glorifying war itself. Also in my collection are artifacts that were brought back by the veterans from the theater in which they served. While to some people, viewing these items may conjure negative and visceral responses, they still serve to tell a story that shouldn’t be forgotten. One of my relatives returned from German having recovered a great many pieces from the Third Reich machine after it was defeated by May of 1945. Still, this is not celebrating war nor the defeat of a (now former) foe. There are other facets of my collection that are touch on the functions of engagement and combat; specifically armament and weapons. I have a few pieces that I inherited that, at some point, I will be delving deeper (on this blog) as they do fascinate me. I need to spend some time expanding my knowledge a bit more in order to present these pieces with a modicum of understanding (alright, I’ll admit that I don’t’ want to sound uneducated on my blog). Frankly, weapons are not my forte’ but what I own (a small gathering of edged weapons and ordinance), I have spent some time learning about them. I have a smattering of edged weapons (or, in this case, an edged tool) that I mostly inherited. This bolo knife was carried by Navy Pharmacists Mates (a.k.a “corpsmen”) who were attached to USMC units. The “U.S.M.C” embossed on the blade represents the United States Medical Corps. M1917 U.S. Military bolo knife and scabbard. Preserving history is paramount to helping following generations to both understand the cost of war and that, while doing what is necessary to avoid future wars, serves to illustrate that nations not only should but must take a stand against tyranny and evil. History is continuously subjected to revision as stories are told and retold. Researchers and historical experts are seemingly discovering previously hidden facts or secrets that shed new light on events. With the new revelations, previous facts surrounding historical events are skewed or changed causing a re-shaping of timelines and ultimately public perception. Hollywood however, seems bent on taking a different tack with regards to revising history in order to reshape producers’, directors’ and actors’ bank accounts. This scene shows the disguised American sub (“S-33”) meeting with the U-571 in a rouse to obtain the Enigma code machine (source: Universal Pictures). In April of 2000, Universal Pictures released a highly successful historical-fiction movie depicting the U.S. Navy’s successful capture of a Kriegsmarine u-boat during World War II. The premise of the film was centered on seizing the keystone encryption device (often referred to as Germany’s “secret weapon”), the Enigma encode/decoding machine along with the codes. While director Jonathan Mostow (who also co-wrote the screenplay) navigates around the historical truths by conveniently mentioning that the story is a compilation of actual events rather than being based on a true story. While this may have worked for American audiences, Great Britain’s Prime Minister (at the time of the film’s release), Tony Blair agreed with discussion (about the film) in Parliament that the story was an affront to the British sailors who gave their lives in the actual retrieval of the Enigma device during the war. Rather than embarking on a mission to demonstrate the challenges created by Hollywood’s propensity of altering reality (albeit for entertainment purposes), I want to focus more on the capture of the machine and codes and what that meant for achieving an Allied victory over the Axis powers during World War II. This Enigma is an German navy (Kriegsmarine) example. Prior to the United States’ entry into WWII on December 8, 1941, Europe had already been gripped with conflict for twenty-five months. 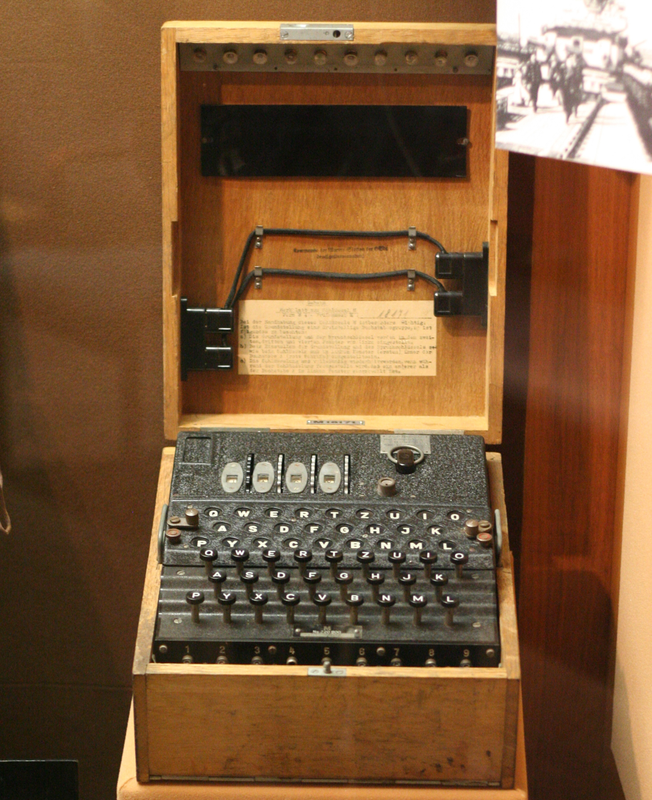 Though it was a highly protected secret, the Allies were fully aware of the existence of the Enigma machine and had already seen successful code-breaking efforts (by the Polish Cipher Bureau in July of 1939) until continued German technological advances rendered those efforts obsolete. It wasn’t until May 9th, 1941 that the Allies achieved their most substantial breakthrough with the British capture of U-110 along with codes and other intelligence materials. One of the events that is allegedly covered (by the U-571 film) is the United States’ capture of the U-505 in 1944 (three years after U-110) which was towed to Bermuda. Following the war, the U-boat was towed to Portsmouth Navy Yard, New Hampshire where she sat until being transported to Chicago to be displayed as a museum ship. The U-505 is now preserved inside the Chicago Museum of Science and Industry. Also on display are two Enigma code machines. In addition to the two machines in the Chicago MOSI, there are a handful in museum collections around the globe. Due to the scarcity of the devices, their notoriety and the impact of their capture had on the outcome of the war, Enigmas command incredible premiums when they surface on the market. As recent as 2011, a Christies’ listing yielded a sale with the winning bid in excess of $200,000. 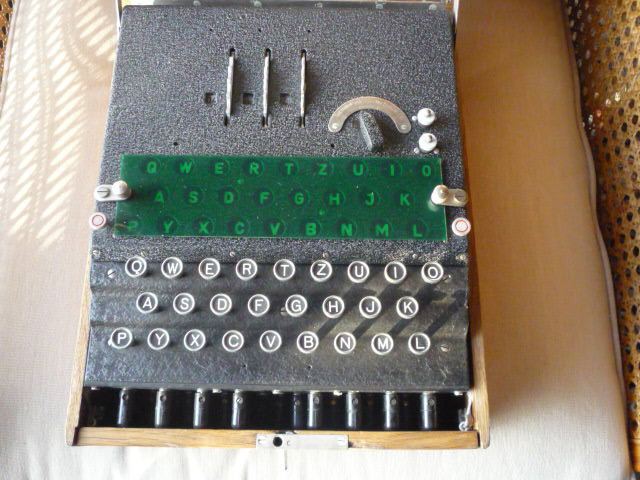 This Enigma’s selling price was in excess of $35,000 (US) when it was listed at auction in March of 2013 (source: eBay image). Most recently, the winning bid for an online auction listing (for a three-disk Enigma) seemed to reflect a more modest price as it sold for “only” $35,103. One has to wonder why, in only two years, would there be such a considerable price disparity (obviously factoring model, variant, condition, etc.) between the two transactions. Perhaps the current state of the economy is at play? Maybe the collector or museum with deep pockets was eliminated from the market with their purchase in 2011? Perhaps the $200k selling price was an anomaly and this recent auction reflects a more realistic value? Either way, the Enigma will remain…well…just that…an enigma with regards to my own collection and the possibility of ever possessing one.